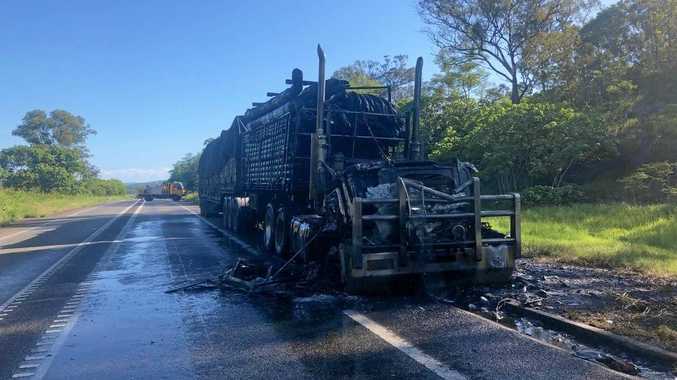 THE burnt-out shell of a B-Double is blocking the Bruce Highway near Mackay after it burst into flames this afternoon. Fire crews and police were called to the scene, 3km south of Sarina, at 3.19pm. A Queensland Fire and Emergency Services spokeswoman said two rural fire and two urban fire crews were at the scene. It is not known what type of cargo the truck was carrying. A spokesman for Queensland Police said the truck had been completely destroyed but the driver of the vehicle had escaped with no injuries. He said police believed the fire had been caused by an engine failure. The highway is still blocked but local traffic diversions are in place. The police spokesman said it could be shut for another two hours.